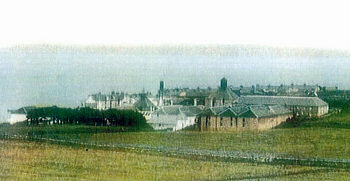 First an old picture with view from somewhere near Octomore over Port Charlotte with the distillery, I'm guessing it might have been called Lochindaal Distillery then (not sure when colour photography was invented, picture courtesy of Bruichladdich Distillery). 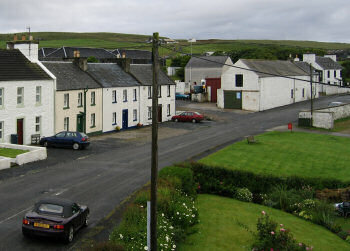 The second image is a very similar view, taken during the Port Charlotte Dusk Walk of the Islay Walking Week 2004. And finally in the third picture a view from the Port Charlotte Hotel over Clyne's Garage and the roofs of the warehouses (behind the row of houses), which will be the location of the ‘new’ Port Charlotte Distillery. I understand from a report in the Ileach that the distillery will be built within the existing warehouse buildings (the ones clearly visible in the pictures above), while a new building on the current site of Clyne's Garage will house offices, a shop and a function room (pending planning permission).